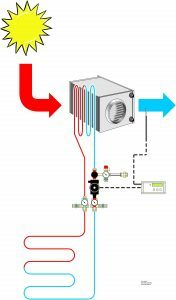 Ground heat exchangers – what for ? In the very cold winter, ventilation units with highly efficient heat recovery can cool down the outgoing warm air well below the freezing point. Doing this, its water vapour can condense out not only but can also freeze. Thus, the heat exchanger might become clogged and damaged. To prevent this, the incoming fresh air must be warmed at -1 to -4 degrees Celsius, depending on the efficiency of the heat recovery unit. A netec brine to air heat exchanger uses for this alone the warmth of the ground, that has in a depth of 1,5 to 2,5 m in the winter a temperature of +5 to +8 degrees Celsius. To win the heat from the earth, a brine pipe is installed in the ground and a special brine-to-air heat exchanger is installed in the outdoor air intake line, which transmits the heat of the brine to the incoming air. In the brine line, a small circulation pump is installed. To control the whole there is a special temperature-controlled variable brine pump controler. Such pre-heating of the incoming fresh air is also necessary if the ventilation-unit is fitted with an so-called “integrated frost protection” if this operates only by slowing down or even stopping the incoming airflow. Such stopping indeed can warm up the unit with the outgoing air’s heat. However, in whole or in part, lacks the fresh air supply and heat recovery. The house creates a vacuum and the lack of fresh air is drawn in through cracks and joints of the building envelope. This is undesirable in the cold winter. Only pre-heating the incoming air to just-above zero will particularly in winter guarantee a well-balanced and full efficient heat recovery. In hot summers, a cool house is pleasant. But how do you prevent excessive indoor heat? First of all, keep heat out by applying a good heat insulation to the house and shading windows against direct sunlight – easiest with outer shutters. And then, don’t let doors and windows open for too long in the ground floor, lest the cool air cannot escape. Windows in the upper floors may remain open. If this is insufficient, and if you have a ventilation system, you can use it to bring in cool fresh air and thus expel hot air. An air conditioner devours a lot of electricity, so best is to utilise the coolness of the earth. In summer, the ground temperature in a depth of some 1,5 to 3 metres below surface is much cooler than the outdoor air. It therefore can cool air by taking up excess heat. A netec ground-to-air heat exchanger transports the coolness of the ground into the fresh air only by a small brine-circulation pump very effectively. Only 15 watt pumps power can generate up to 2 kilowatt cooling effect. netec brine-to-air heat exchanger pre-warm frosty air in winter and pre-cool hot air in summer. So, in winter, it reduces energy consumption and protects the ventilation system from damage through frost whilst in summer it makes your home more comfortable. This is why it is being built into many passive houses and other buildings that have highly efficient ventilation systems. Alternatives? Are there any simpler solutions? Dug-in air channels need to be some 40 metres/yards long (once around the house will do), should be dug some two metres (80 inches) deep into the ground and have a diameter of some 20 cm (8 inches). For planning and calculating, PH-Luft software from the Darmstadt Passivhaus-Institut may be used. – For easy heat exchange, pipes should be of thin wall thickness but must be safe from damage and leakage through later earth and traffic loads. At the lowest point, drainage with a backflow stop must be installed to let condensing water out without allowing rain water to leak in. The pipes should therefore be laid just a bit down-graded to allow condensing water to collect at the drainage tap. The pipes must be accessible for cleaning and maintenance and must not have bends or branch pipes that cleaning machinery cannot pass – see mistakes shown in the picture. Dug-in air channels have often been installed in the past. Their pipework was often of cheap produce, the drainage was rather improvised and the earthwork expenditures miscalculated. In some cases, pipes broke in the course of subsequent surface weights or were flooded (see picture 2). Besides unprofessional varieties, complete systems have been offered (see Rehau). Whilst the functionality of dry dug-in air channel systems is undoubted, there are doubts concerning hygiene. Air is our most important comestible. A dug-in air channel with poor access for cleaning can with time develop some unidentifiable inside biology of its own which to breathe can turn out to become harmful. This was the reason to start the development of brine-based earth heat exchangers. Electric heaters are simple to build in, but when including overheat protection and airflow supervision, are not cheap to obtain. Electricity is the most expensive energy source, and many heaters have inaccurate control, which can result in occasionally too hot air. This increases power waste and reduces the effect of th heat recirculation system behind, particularly if the control just switches on and off. Their hot wires can cause the smell of burnt dust as is well-known from electric fires. Naturally, cooling in summer is impossible. Water-to-air heat exchangers taking their heat from the central heating system are harder work to install. Gas as energy carrier is cheaper than electricity. 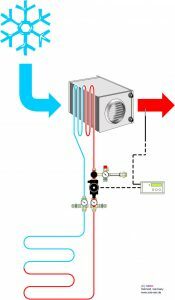 Controlling is done with an antifreeze thermostat valve in the air pipe. These work fairly inaccurately, so again there is risk of the incoming air getting too hot and heat recirculation being poor. Also, there is a risk of complicated interference with the existing boiler and pump system, when warm water has to be obtained also when the heating is set low at night or at times when loading hot water boilers only. The worst problem is that in case of a boiler failure the outdoor heat exchanger can freeze and burst draining and thus paralysing the entire heating system. This to hinder a separate water cicuit with antifreeze additive is very elaborate to install. Also, again, cooling of hot fresh air in summer is impossible with a hot water based system. At least the brine-to-air ground heat exchanger system, like netec offers, seems to us to be the best solution for the winter air pre-heating and the summer air pre-cooling with low hygienical risks and energy needs..